What if ancient religious manuscripts once thought to be lost weren’t lost at all? Professor Todd Hanneken, Ph.D., is the first scholar to combine two existing imaging technologies in order to “see” handwritten text that has been indecipherable to the naked eye for hundreds of years. To understand the impact of Hanneken’s work, we’ll need to take a step back in time. A conventional photograph of a page from the Jubilees palimpsest, which was first written in the 150s B.C. but erased and written over in the eighth century. Notice the barely detectable text behind the black ink. Until the invention of paper, it was a common practice to erase the text of a manuscript to make room for new writing. The result is known as a “palimpsest,” with only ghostlike traces of the original ink remaining. Palimpsests are valuable for studying the early development of religions and cultures because they tell the story of how some beliefs fell from dominance, and how others came to be favored. Hanneken is most interested in an ancient work called The Book of Jubilees. Attributed to Moses, it’s a rewriting of Genesis and Exodus that makes significant changes to the original. “For example, it fixes contradictions as to whether Adam was created before or after animals, and it fills in gaps such as the existence and names of the daughters of Adam and Eve,” said Hanneken. Though the author’s original manuscript of Jubilees is lost forever, several groups throughout history copied and translated Jubilees into their own languages. Of course, with each copy and each translation, the stories were told a bit differently. “It’s like a game of telephone,” explained Hanneken. The specific copy Hanneken studies is a palimpsest. It was translated into Latin by Arian Christians in the fifth century A.D., but after they were later suppressed, their Jubilees was erased and written over in the eighth century with more dominant beliefs of the time. 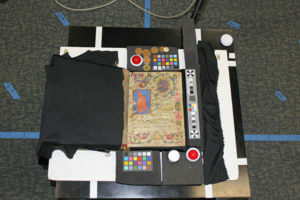 An illuminated manuscript test artifact shown using conventional photography (first in row) and then using additional spectral and reflectance transformation technologies that will be applied to The Book of Jubilees. Modern scholars would eventually regain interest in these old “heretical” writings, but after centuries of neglect there was little evidence left to study. There were much later translations found in Ethiopia and traces of the erased Latin translation, but it was not clear how old Jubilees was or what role it played in ancient Judaism. In the 1940s, though, there was a breakthrough. of Jubilees from the 150s B.C. This signaled that Jubilees was considered scripture to the Scrolls’ contemporaries, and it gave scholars an early copy with which to compare the Latin palimpsest. To piece together how Jubilees went from being considered scripture in B.C. 150 to being nearly forgotten in the eighth century, scholars first must be able to read the text. Today, Hanneken directs The Jubilees Palimpsest Project and its team of scholars from around the country, which aims to do just that. The last time someone tried to publish a transcription of the Latin Jubilees palimpsest (which is housed in a library in Milan) was in the mid 1800s by a priest whose only tool was a magnifying glass. Even good photographs could only tell basic information about what was written. Some of the pages, made of parchment prepared from animal hide, have holes or blemishes that can be a red herring. “It is possible to mistake a small pockmark for part of a letter,” Hanneken said. Now, he and his team are integrating two existing technologies to unlock information that a photograph cannot. Hanneken’s team combined two common imaging technologies — spectral imaging and reflectance transformation imaging — which, up until now, were impossible to employ simultaneously. “For many students and scholars, this copy will be the closest they come to handling a fifth-century manuscript,” Hanneken said. At a high resolution, the technology can make apparent the thickness of the ink, or corrosion where lost ink has eaten into the parchment. When combined, a user can interact with a holistic, digital version of the artifact. The digitally preserved palimpsest will allow scholars to more accurately transcribe and better understand manuscripts like Jubilees that provide context for the cultures that gave birth to the Bible, Judaism and Christianity. In the first phase of the project, Hanneken’s team tested the technology, which takes 315 pictures of each document or artifact from 35 different positions and angles to create a comprehensive and interactive version of the item. Next, the team will travel to Milan to apply this technique to capturing the Jubilees palimpsest manuscript. Associate Professor of Theology Todd Hanneken, Ph.D., has a bachelor’s in Jewish Studies, a master’s in Scripture and Interpretation, and a doctorate in the Hebrew Bible and Judaism in Antiquity. He directs The Jubilees Palimpsest Project, funded by a $60,000 grant from the National Endowment for the Humanities. Below are videos showing the use of spectral imaging and reflectance transformation imaging to enhance artifacts and documents. The technology will take 315 photos from 35 different positions in order to create a comprehensive and interactive version of the item.